Last year I had lots of strawberries from my bed, I think it was a fantastic year for most of the local strawberry producers. I still needed to buy more for my year’s supply. But this year, I have hardly gotten any. There are more coming, but not even remotely what we might use in a year. So off to our local strawberry producer – Michell Farms. 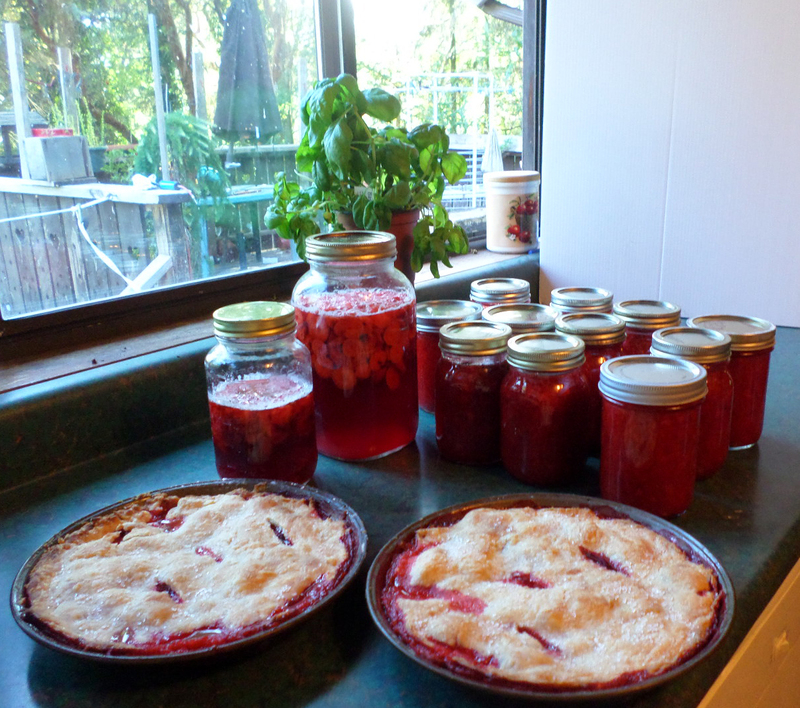 4 Flats later, I’m back at home hulling strawberries and making jam, pies and strawberry infused vinegars, as well as just plain freezing lots of berries for desserts and smoothies later in the year. I must admit, I managed to eat quite a few as well. I think fresh local strawberries has got to be one of my favorite foods, and having them in the freezer for later is second best. The flavour is soooo much better than those imported ones. All in all a satisfying day! 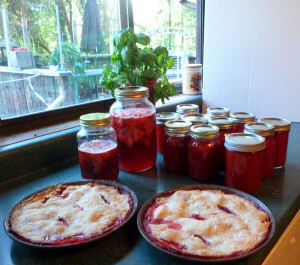 Those pies look amazing – and the canning. So what do you use the strawberry infused vinegar for? Salad dressing? Funnily enough, this is the first year that Rowan’s strawberry bed has produced anything like enough for us – like you did this year, I usually buy a flat or two from Dan’s to do jam – but – we’re not eating much jam these days, so I still have a dozen jars from last year, so I’m not making it this year, which I guess is why Rowan’s strawberries look like enough. We don’t buy strawberries except when they’re available locally – haven’t for years – we’d rather wait for the “proper” taste.